Almost a grand Pollok performance by Hutcheon! Greig Hutcheon has been a professional for 26 years - since 1992 - but there's a lot of golfing life left in the Aberdeen-born competitor. Today (Wed) he won the Pollok Golf Club pro-am's individual pro prize with a four-under-par score of 67 - one shot ahead of Paul O'Hara - and, with a cheque for £984, boosted his earnings for the month of May to £3,689. So Hutcheon, pictured, has finished first, second, third and fifth in the four pro-ams he has played this month. At Pollok the Paul Lawrie Golf Centre player had an eagle at the 15th, birdies at the second, third, seventh and 10th, offset by bogeys at the first and eighth. 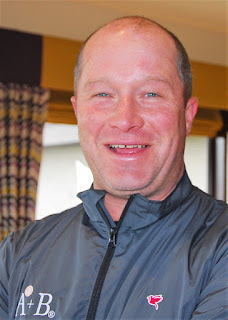 Hutch also earned £115 in team event in which he and his amateur partners finished joint second. 69 G Wright (West Linton) (£590). 70 D Orr (Eastwood), N Fenwick (Dunbar), R Leeds (Archerfield Links), R Arnott (Bishopriggs) (£336.74 each). 71 S Binning (Mearns Castle) (£216.53). 72 C Currie (Erskine) (£187.03). 73 G Fox (Clydeway Golf), S O'Hara (N Lanarkshire Leisure), G Hay (Mearns Castle) (£150.49 each). 74 C Ronald (Carluke), S Henderson (Kings Links) (£123 each). Each of five pros received £115. 127 G Hutcheon and Claymore Consulting Services II, D Orr and Blantyre Park Services. 130 G Hardy and Team G Peters; G Wright and Team Cup and Saucer.